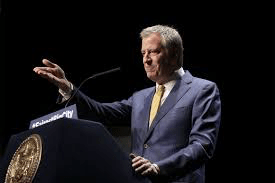 New York City Mayor De Blasio thinking of joining the crowd running for President…. The ‘Big Apple’ left leaning Democratic is getting ready to head up to New Hampshire the early primary state…..
New York City Mayor Bill de Blasio is making moves toward a possible run for president, soliciting City Hall staffers with national political experience and preparing to travel to the early primary state of New Hampshire this week, several sources familiar with his plans told POLITICO. After a visit to Harvard’s Kennedy School to discuss his time as mayor this Thursday, de Blasio will travel the next morning to Nashua, N.H. There he will meet with Mayor Jim Donchess and may chat with locals at a diner, City Hall Communications Director Mike Casca confirmed. “He wants to make sure ideas like pre-K for all, paid personal time and mental health are on the table as Democrats debate the party’s vision for the future,” Casca said in a prepared statement, referring to some of de Blasio’s key policy priorities as mayor. Casca, one of two City Hall aides assisting with de Blasio’s early presidential ambitions, previously worked for Bernie Sanders on his 2016 presidential campaign and in his Senate office…..
Where have you gone, Bill de Blasio? I wonder how many lefties can Democrats get to split the nomination votes? There were 17 Republican wannabe’s in 2015-6 (and only 5 Democrats), but the GOP won.